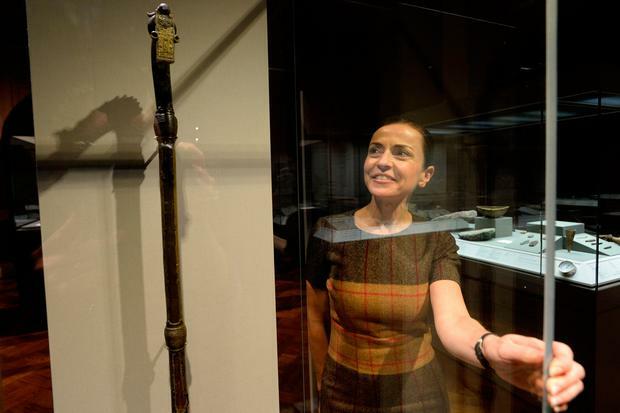 A 1,000-year-old medieval crozier that lay buried in a bog for centuries has gone on public display in the Republic for the first time since 1932. The 'Prosperous Crozier' is believed to be the oldest intact pastoral staff in existence in either Ireland or Britain, and one of the oldest in Europe. It has been handed over to the National Museum of Ireland on loan for an indefinite period and is officially on display there as of yesterday. The staff resembles a shepherd's crook and was used by abbots in medieval monasteries as a potent symbol of Christianity. It ranks among other artefacts and relics from the Golden Age of Irish Art, including The Book of Kells, and the Ardagh Hoard, which includes the Ardagh Chalice and the Cross of Cong, according to University College Cork archaeologist Dr Griffin Murray. The crozier is believed to have been used at St Mary's Abbey in Dublin due to a faint inscription in Latin bearing the abbey's name. However, after the Christ Church Cathedral crozier was publicly burnt during the Reformation, it's likely that monks or even local people buried the crozier to protect it in a bog near Prosperous, Co Kildare, where it was unearthed by a turfcutter in 1839. It was then handed over to the Jesuits at Clongowes Wood College where it has remained ever since. "It's incredibly well-preserved," said Dr Murray. The only flaw is that it was broken in two on purpose - possibly to conceal it.